I opened my eyes with the strangest sensation of waking up to a different reality. Instead of a confused mind and an exhausted body, I was alert and well rested, and I came out of bed to prepare coffee to put myself to work at 6:30am. I wanted to hit the gym in the morning, but I couldn’t pull myself away from the computer until the sun began hitting the monitor at 5pm. The work tackled was very challenging, and I had been putting it off because I knew I wasn’t in the right frame of mind. I noticed myself no longer grinding my teeth or holding my breath, no voice in my head complaining, and I took no unnecessary breaks. A metaphor came suddenly to my imagination: I was a hot knife cutting through butter. What was I before? I thought: a dull saw cutting through metal. After lunch I had a brief nap, and I dreamed I was sitting at the table with my brother and a friend. “Have you ever dreamed that you are working?” I asked them. They both rolled their eyes like saying jeez, not this again. The subconscious was kind enough to provide two characters who never appear in my dreams so that I didn’t err the meaning: it’s time to broaden the perspective, my life has been nothing but dreams and work for the past ten weeks. I finally hit the gym and found a great working spot where I put another hour of work before my workout. Then I relaxed myself at the sauna and meditated with a clear mind for a long time. I left the gym somewhat mystified at the sudden upswing in mood. I’m not attached to it (I only know too well that by trying to hold on to it, it would squeeze right out of my hands), but I can only help at being disconcerted at the seemingly disproportionate effect on mood. A memory from almost a year ago came to mind: I was beginning my sabbatical, and I had the opposite problem that I have now: I wasn’t getting attached enough to my projects as to bring them to conception (let alone gestation and birth). The enthusiasm for my ideas would fizzle out as soon as I began working on them. So I decided I needed a break, and I head to Alicante to explore some caves. Though I accomplished what I planned, I didn’t really feel connected to my adventure. It was exhausting and it felt pointless. I was coming back home dejected, and when I arrived to the bus station in Alicante City I saw that I had lost my bus, and the next one was leaving in three hours. Unenthusiastcially, but with nothing else to do, I left my backpack in a locker and head out to explore. 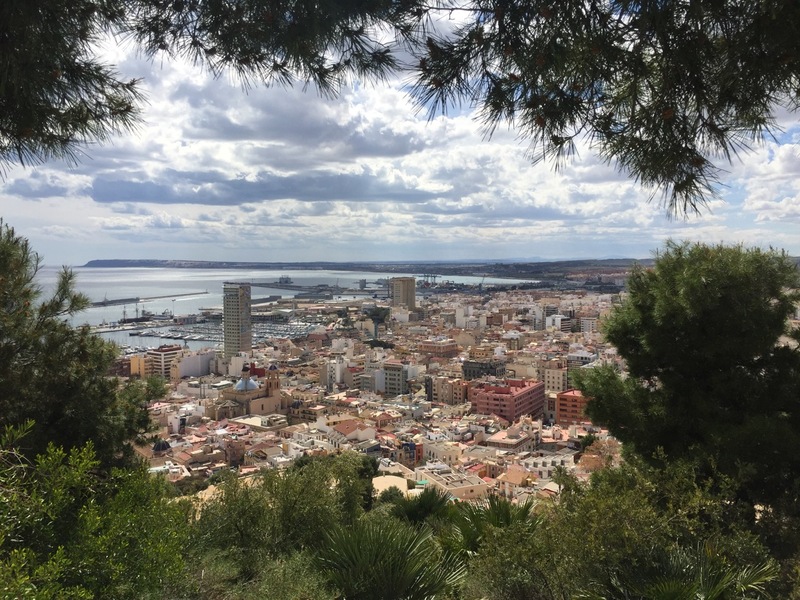 In the middle of the city there’s a high hill with a fort called Castell de Santa Bàrbara, I approched the hill through the city streets, trying to find a way up, but everything seemed closed off. After sorting through some narrow pedestrian corridors I came across a sun bathed patio full of flowers, and a beautiful young woman was helping a young toddler take her first steps. I asked her if this was the way up, pointing to the narrow alley up ahead. She looked up and smiled “Well, yes, you could go up that way, but I wouldn’t recommend it. It’s steep and a bit dangerous. But if you head back in the direction you were coming from, eventually you will find a staircase, and on the way up you will find a very nice viewpoint shaded by trees where you can rest a bit”. In an instant the heavy clouds that sorrounded me were dispelled, the beauty and the kindness of the moment unthawed my heart and I smiled for the first time in weeks. I thanked her profusely, turning around just in time so that she could not see my eyes filling with tears. On my way up I sat down at the viewpoint she had recommended. The setting and the view were indeed beautiful. My photo makes no justice to the effect it caused upon the soul, but I was glad to find it in my library. The entire trip had become worthy just for that moment of kindness. And walking back from the gym it hit me: it’s kindness which struck my heart once again.